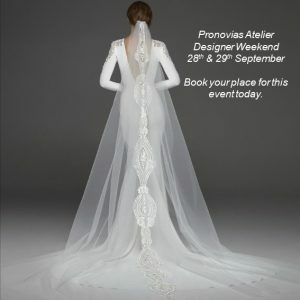 28th & 29th September we will hold our much anticipated Pronovias Atelier Designer Weekend! We will be launching our 2019 Pronovias Collection along with additional dresses for this weekend only! Any orders for Pronovias Atelier placed on this event with qualify for 5% off! View more information by visiting our Pronovias Atelier Trunk Show September 2018 page. Submit your appointment request via our Contact Us page.